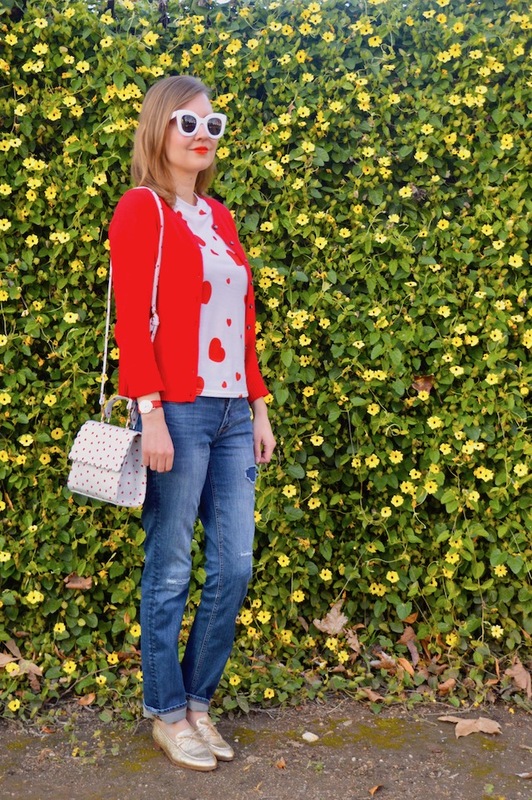 Valentine's Day is right around the corner so, of course, I am trying to wear as much red, pink, and heart print as I possibly can! Actually, I like wearing those things all year round but it's fun to celebrate Valentine's Day in your wardrobe for at least a week before the actual holiday! Unfortunately, last week I was sick and it's also been raining cats and dogs here nonstop, which means I haven't exactly been wearing a lot other than sweatpants and rain gear! Luckily, however, this casual heart tee is comfy and casual and the rain thankfully let up just enough to snap these pictures, so it all worked out! I should also mention that this tee is a steal at only $10! Plus, you can save an extra 15% off with code SH4068 from now until March 31 on this tee or anything else you like at SheIn! The one good thing about the rain is that the flowers are already starting to bloom here in Los Angeles and it's going to be a beautiful spring! I'm not big into getting a bunch of expensive flowers for Valentine's Day, so my husband usually just buys me a modest bouquet at Trader Joe's, which is fine because they are just as beautiful as a bouquet that costs ten times as much. 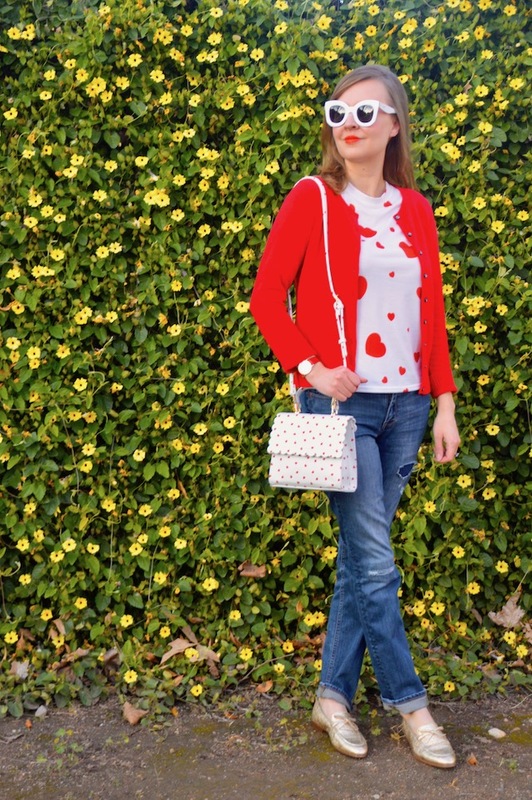 Also, I would rather save the money and put it toward accessories, although, like flowers, you can also find accessories that are a great price but still look impressive, just like this heart bag, which is only around $30! It's going to be a Valentine's Day favorite for me for years to come! 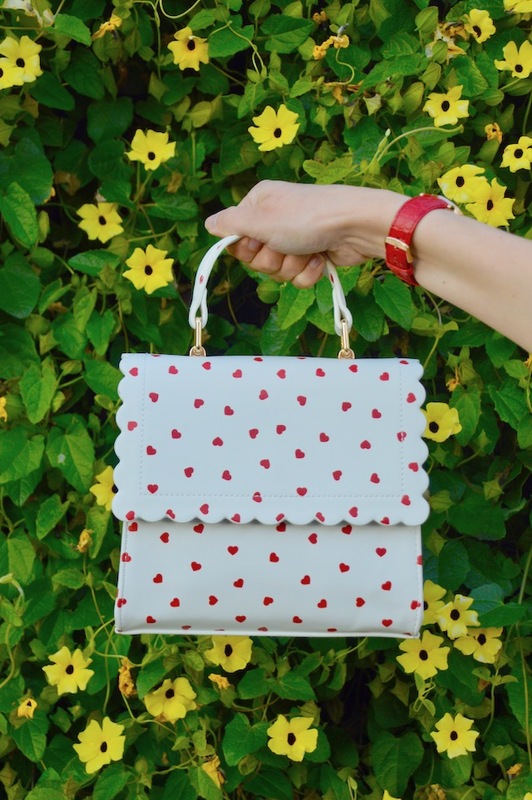 Below are some other cool heart bags that are perfect for the holiday! In the future, I think I might dress this heart tee up with a skirt. In fact, I have the perfect Kate Spade skirt in mind already! 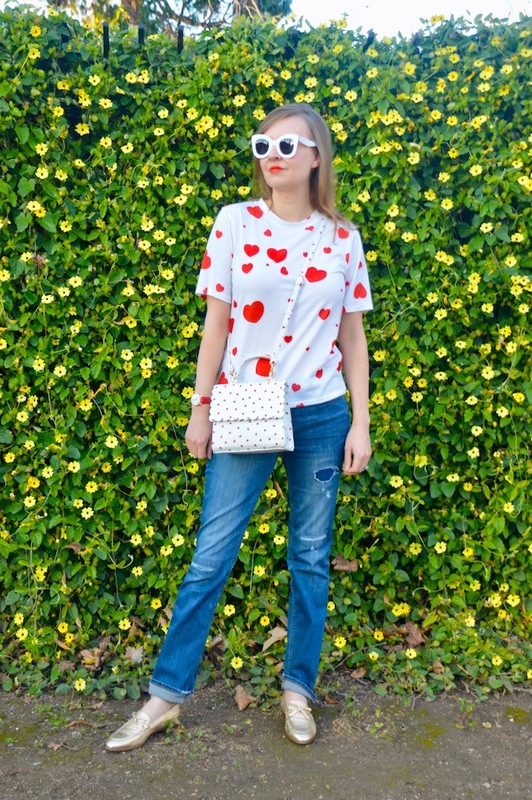 I might even try wearing this tee and that skirt on Valentine's Day, although I have so many heart options that I may go with something else! (Stay tuned on Instagram to see what I wear on the day!) 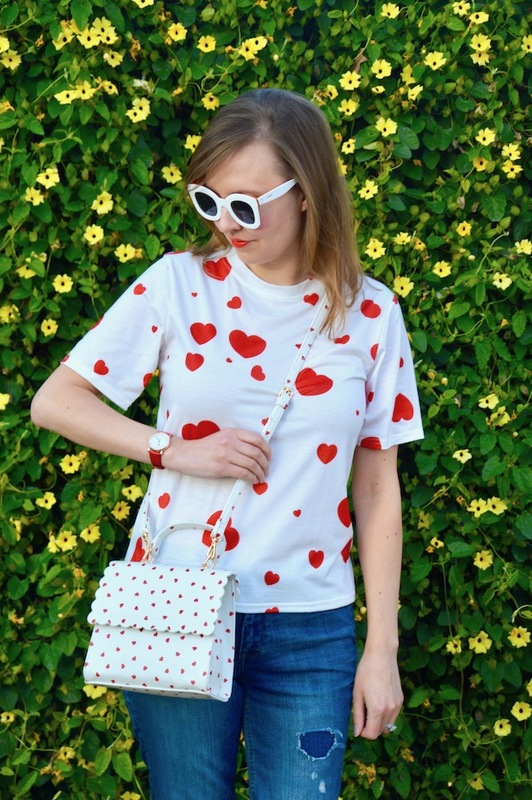 Regardless, it's nice to have different clothing options on Valentine's Day, especially affordable one's like this tee and my new favorite heart bag! 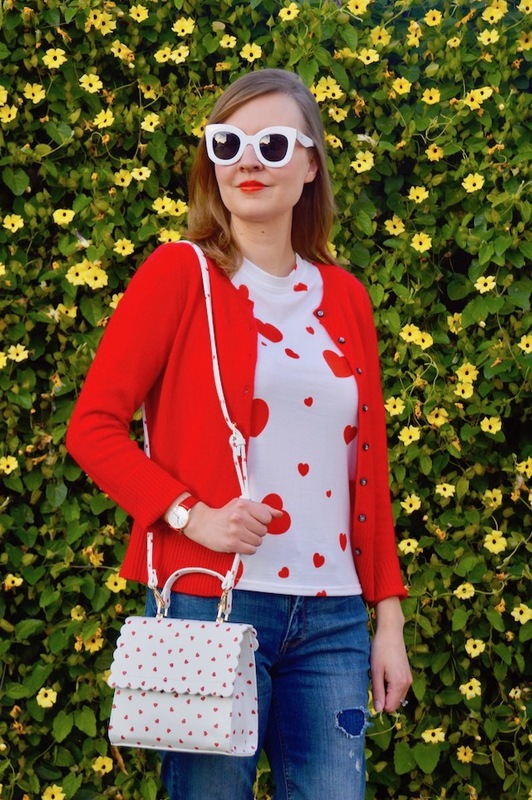 I am swooning over your heart handbag! It's so cute! Aww what a sweet outfit. That heart handbag is really lovely. Hope you're having a lovely day! Love the bag, and all the other bag picks! Your matching hearts are too cute! 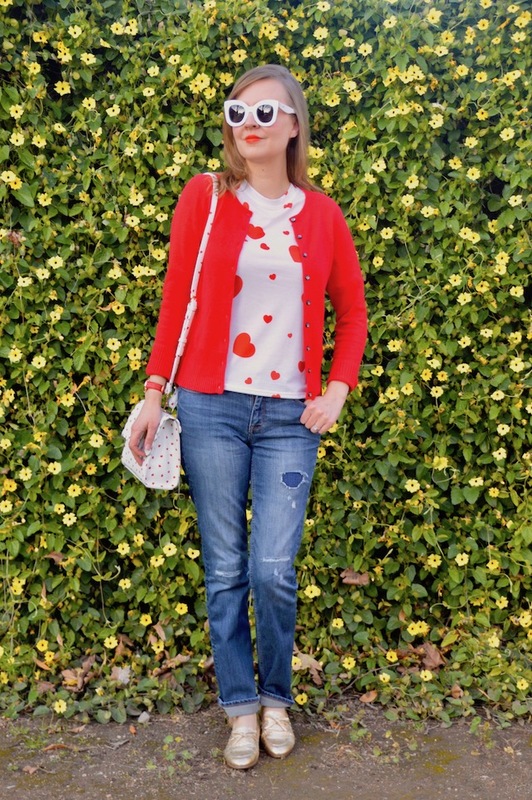 such a cute valentines outfit! you look so darling! Sucha a darling look! 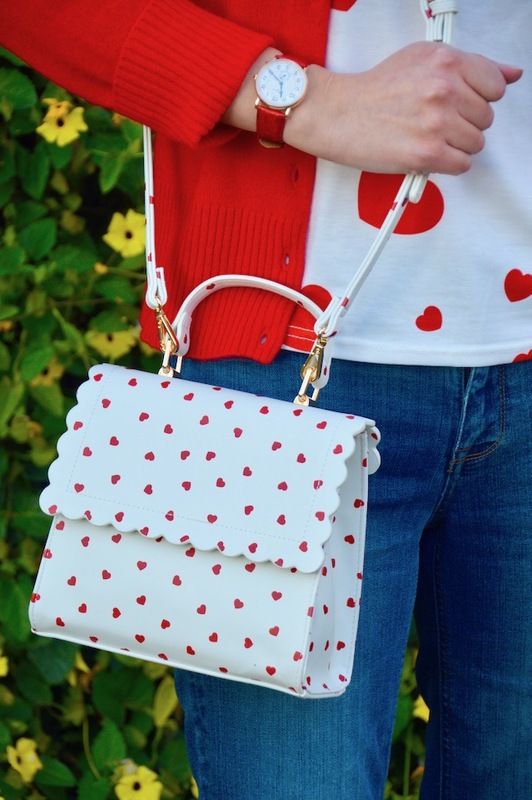 Love the bigger and little hearts and that bag is SO cute! Love this look on you.